Control over various aspects of the search engine optimization (SEO) on your site are provided when editing a Post, Page or (if applicable) Product in your WordPress install. 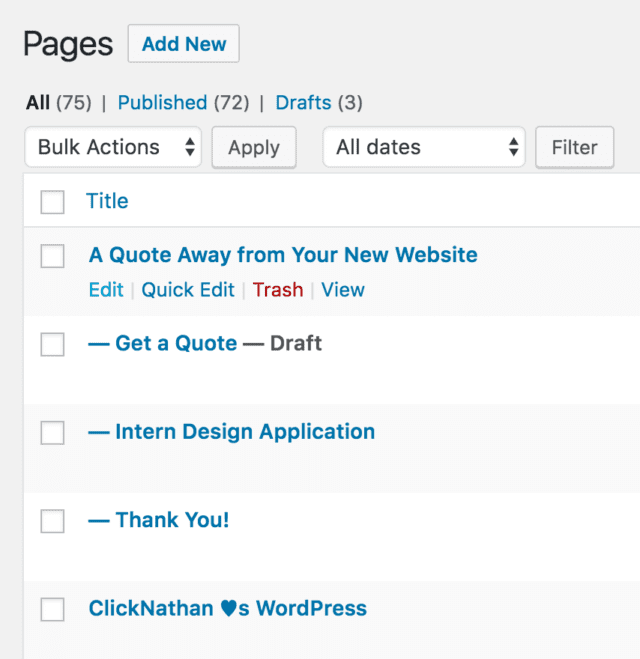 To start managing your site’s SEO on a page-by-page basis, head into any WordPress editor screen (via the Posts, Pages or Products navigation items on the left side of the screen), and scroll down to the SEO box. An example of a listing of Pages on your site, accessed via the Pages tab on the left hand navigation. Find the one you want to work with and click on Edit. This is the tab we’ll be primarily working with. 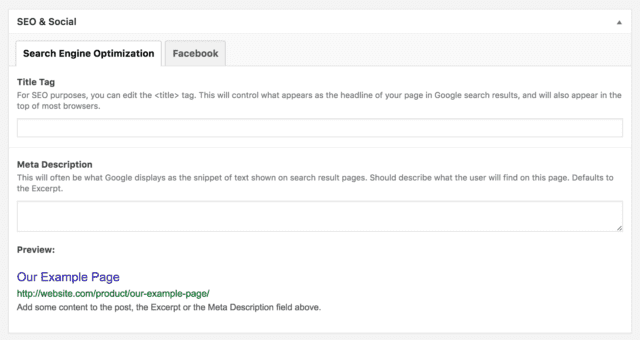 The Title Tag option controls a few things on your site’s pages and elsewhere around the web. This setting affects where you’ll show up in Google’s search results, what users will see in the search results as the title of the page, and what displays in the browser tab. More importantly, this is the text that will be displayed as the title of your page in Google’s search results. The Meta Description tag controls the text snippet shown in Google’s search results. It’s added as some behind the scene’s code on your pages, so you won’t actually see that text displayed on the page itself. It does not affect where you’ll appear in search results, but instead acts as a “pitch” to readers as to what the page is about. You should use this area to describe exactly what they’ll find in the most compelling way you can come up with. More info on meta descriptions here. Title will be set to whatever the Title field at the top of the page is set to by default (the first field at the very top of the page). If you edit the Title Tag field, it will replace the title in the preview (and Google’s results pages). Link is controlled via the Permalink setting near the top of the page. You can only control some aspects of this, as your domain name and certain folder displays aren’t editable. Description / text snippet will be auto-generated from the first few words of the Content Editor (where you type the body text of the page), by default. If you add some content to the Excerpt field (found elsewhere on the page), this will override this text snippet. Finally, if you directly edit the Meta Description, that has the highest priority and will change the text snippet, too. In addition to Google, there are some pieces of content we can control when our content is displayed on social networks like Google+, Twitter and, as the tab is called, Facebook. The post on Facebook has four parts. 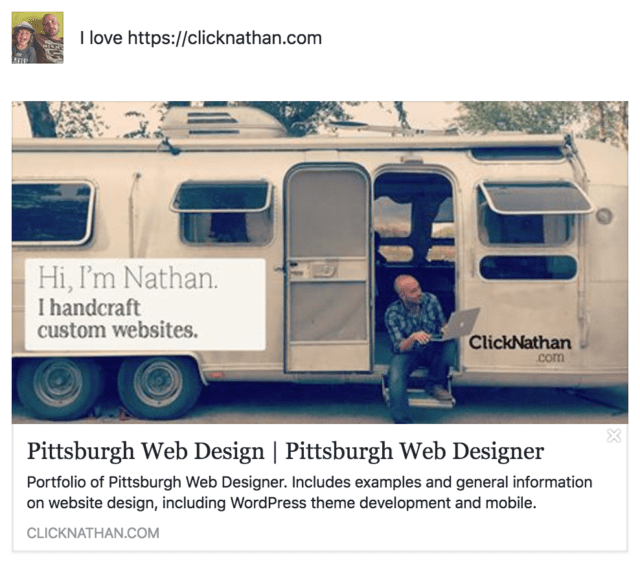 Firstly, where this image shows “I love http://clicknathan.com”, well, we don’t have control over that, it’s the user’s message. The box beneath that is what we can control though, and we do that via our Facebook tab. The image will default to the Featured Image set for the product, post or page. You can override it via the Image file upload button here. Beneath the image, on our Facebook preview above, we can change the Title and Description aspects, as well. Once you configure these fields, Publish or update the page (via the blue button near the top right of the entire page), and go back to the Facebook tab to see it in action. Note that while we’re directly referring to Facebook here, these fields control similar previews on Google+ and Twitter. The above are aspects of a site’s SEO we can deal with on a page-by-page basis. There are a few global options, too. To dig into these, we go to the Theme Options via the left side navigation. Once in there, you’ll see something like this, possibly with more or less tabs depending on your site’s needs. There are many options available, but we’ll focus specifically on those which directly affect SEO. The Twitter Username & Twitter Creator fields will tell Twitter who is the person “tweeting” (aka, the username). If you’re an individual posting for a company, you can put the company name in the username field and your personal account in the creator field. The two Facebook Admin fields will associate up to two accounts on Facebook as having additional access to analytics about the site, on Facebook. Just enter your Facebook ID in these fields. The last two pieces of our configurable SEO pie here are the Open Graph Default Image and Schema Logo Image file upload fields. The first will control the image shown when sharing on Facebook et al if there’s no Featured Image or OpenGraph Image explicitly set. The second simply controls the logo Google will display alongside your content, should you get picked up by Google News. While these are important aspects of your site’s performance, writing great content and when people link back to your page, those are the most important parts of showing up in the search results. Learn more about the whole SEO picture.